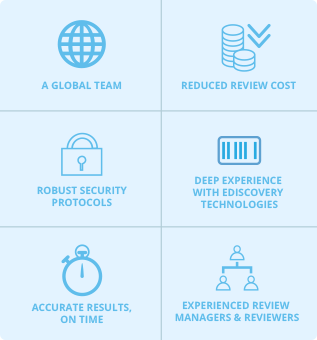 Our experienced review managers optimise workflows using advanced technologies to lower review costs. Skilled legal professionals when and where you need them. Consilio’s pool of skilled legal professionals has proven experience performing document review, ranging from simple responsiveness coding to complex and specialised decision making. Our global reach enables our clients to quickly staff any project with qualified, multilingual reviewers for complex reviews. Interested in joining the Consilio Review Team? Click to submit your CV. Dedicated review coordinator to support the project administratively by liaising between the overseeing lawyer and the review team. Choice to conduct the review in-house or select from our global network of review centres. To find out more about our review centre locations, click here. Access to secure review centres around the globe, each designed to promote productivity. Knowledge of advanced technologies used to prioritise and classify relevant documents for your review. 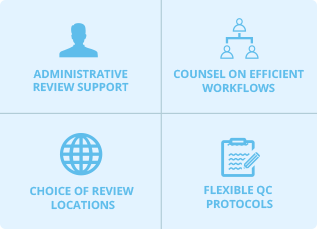 To learn more about Comprehensive Managed Review contact us. A multinational electronics manufacturer required review services using the company’s self-hosted data room (a third-party tool). The project initially required a team of 15 bilingual (German/English) reviewers secured by Consilio within 48 hours. Soon after the project began, the scope expanded requiring an additional set of 40 reviewers. In response, Consilio activated reviewer terminals in our New York review centre and managed the network and data access. As a result, the client was able to meet tight deadlines and keep data secure.